I saw some insanely hi-tech sportswear clad people with two walking sticks each when I was on my road trip last week. Thought they might be doing some serious hike, but they were doing the same relatively easy 3.5 mile or so walk I was doing. 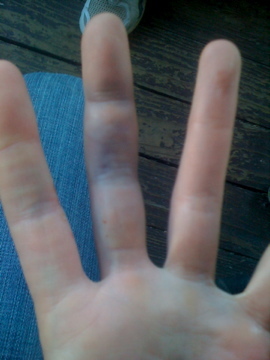 And not the same injury: Sam broke 3 fingers. I squeaked by with just the one. Bummed neither one of us made it out tonight—let’s hang soon! As a child, I remember my mom fashioning a belt for me out of some string and safety pins while saying, “Necessity is the mother of invention.” I had to ask her what that meant, but once she explained, I never forgot. You see? The apple don’t fall far from the tree.